Here at BDG, we love fashion. And, we love seeing the interplay between the fashion industry’s hottest new collections and the home styles of interior design professionals. The two fields aren’t far removed when you think about it. Both are always evolving and prize beauty and line, and texture, fabric and feel. They are also highly personal. 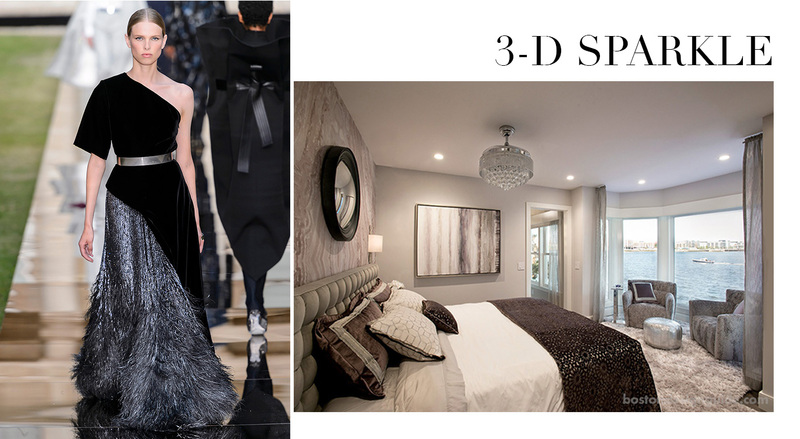 The difference is the medium; while fashion designers use the human body as their muse, interior designers interpret living spaces. Both, in our minds, deserve the “Best Dressed” mantle. 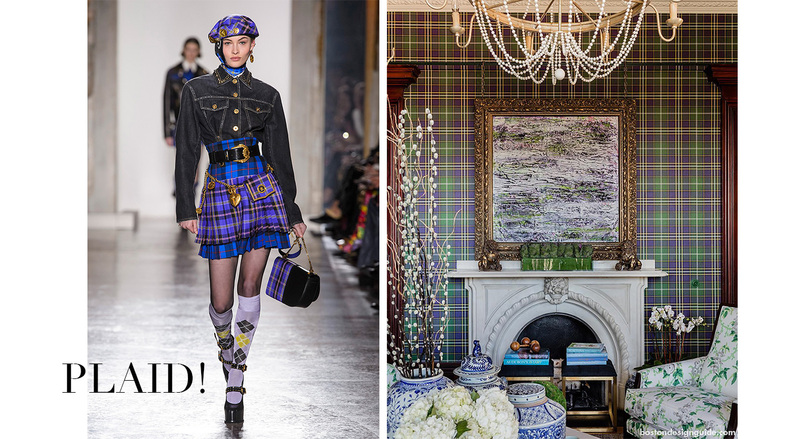 Take a look at seven of the season’s hottest new looks—in couture and in the home. 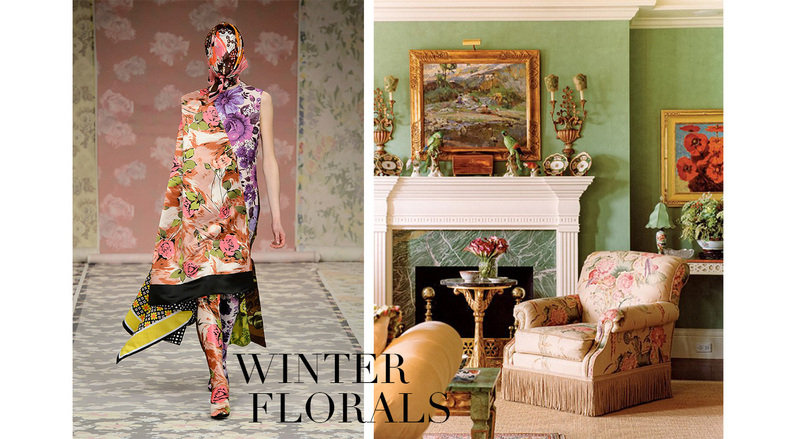 Premier fashion houses like Gucci, Christian Dior, Saint Laurent and Richard Quinn are cultivating rich, beautiful blooms for the fall and winter season. These are not the delicate petals of springtime, but rather big, bountiful blossoms on beautiful silk shifts and dresses. Interior designer Anthony Catalfano’s living room is no shrinking violet either. This luxe and multi-layered sitting room is alive with heady florals—on both the upholstery and in the art—against a fertile jade backdrop. This season, the catwalk is brimming with leopard, zebra and snakeskin (oh my!). Victoria Beckham unleashes leopard in a full-length, split-sleeve coat (above), while Carolina Herrera unites neon yellow with snow leopard in her ready-to-wear collection. Footwear designers (think Chloe, Tory Burch and Yeezy) also have skin in the game and are trotting out python snakeskin boots that fashionistas everywhere are slipping into. Interior designers have long felt the call of the wild. 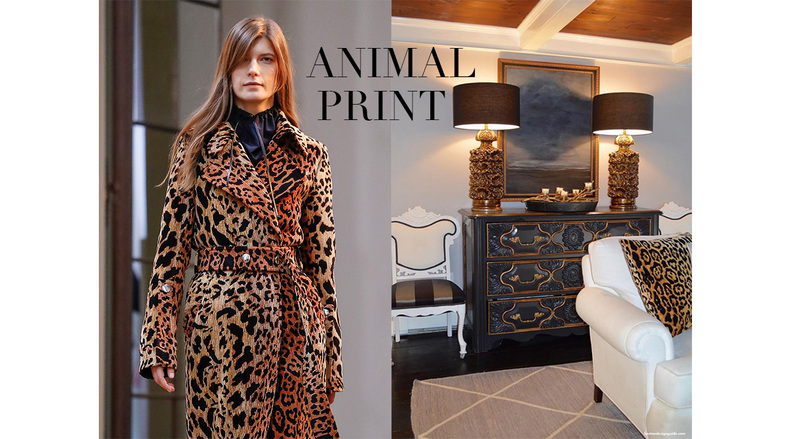 In fact, we were once told that every classic home design should have one statement-making animal print. Kacey Graham, principal of Boehm Graham Interior Design, would agree. She uses a Leopard Velvet fabric by Kravet on a pillow that pops against a snow-colored Sherrill sofa. This is no mere accessory, but rather a touchstone that sets the tone for gilded lamps and a chest of drawers painted in black lacquer and enhanced in gold. One of the more surprising trends to command clothing lines this autumn is the “Go West” style. From leather jackets with fringe (Isabel Marant) to bolo ties (Louis Vuitton) to yoke-like collars and supple leather fur-trimmed coats and vests (DSquared2), designers are reviving the wild side of the American spirit. The living room of a Telluride mountain house, crafted by LDa Architecture & Interiors, also channels a home-on-the-range feel. 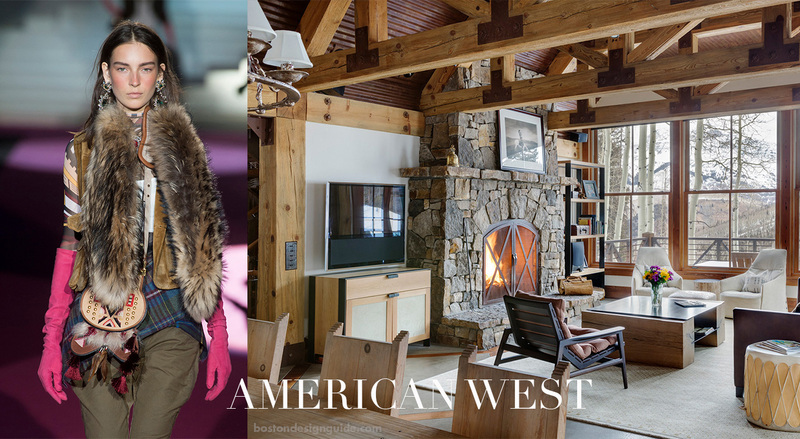 The firm corralled steel, leather, wood and fur accents to imagine a ski country space that is cozy and comfortable “yet still has that air of sophistication,” maintains LDa. Much like DSquared2’s frontier girl getup, shapes and details were essential to instilling a warm, rugged vibe in keeping with its sky-high territory. Autumn collections are heavy on argyle and bright plaids—layered on thick or with other plaids and profiles for an inspired take on the Highland style. Designers have thrown out the Preppy Handbook; Derek Lam dons an abstract check on a natty knit, while Michael Kors presents fashion-forward cropped yellow plaid trousers and a double-breasted tartan plaid Cape coat. Versace’s plaid pleats—shown here in a vivid cobalt—have an undeniable edge, and a healthy dose of heraldry. Interior designer Elizabeth Benedict’s parlor created for the 2017 Junior League Showhouse is more romantic than militant, but, like Donatella Versace’s style, it certainly suggests out-of-the-box thinking. Benedict was inspired by the William Flagg Homer House’s rural landscape for the project, and conveyed a color palette aligned with “the greens of the pasture and lilac glow of sunsets.” She selected a Leland Tartan wall covering from Scot Meacham Wood Home as her canvas, and then bedecked the space in Impressionist paintings, pearls and botanicals. While metallics have been huge for a few seasons now, this autumn they adopt a sculptural sensibility. Erdem is showing beaded spangles under suiting, Tom Ford pairs a silver cocktail jacket with sequin leggings and Calvin Klein is a force on the runway for his futuristic forms. Givenchy Paris pairs shimmering plumes with draped velvet and platinum belting for an effect that isn’t unlike Erika Z. Interior Design Studio's harborside master bedroom. Here, texture heightens the impact of a design that’s a study in platinum and pewter, and the wall covering—like the skirt—imparts a sense of movement. Tactile appointments (i.e. the shag carpet, iridescent sheers, coverlet and fringed pillows) share time with a silver pouf, convex mirror and a chandelier dripping with crystal. 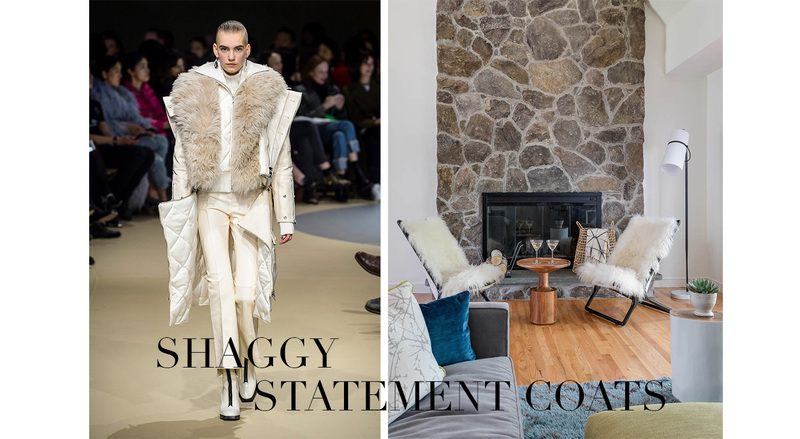 Shaggy statement coats and luxurious faux furs are topping off outfits in a dramatic—and decidedly toasty—way in autumn 2018. From Chloe’s regal double-breasted champagne shearling to Givenchy’s oversized coat in bicolor faux fur to MaxMara’s drop-shouldered alpaca and wool number, this is the year for head-turning outerwear. Interior designers have been known to weave in poufs of perfection as well within their inspired settings. Much like the shag of Alexander McQueen’s quilted bomber above, Barbara Elza Hirsch brings a dual hit of piled-high interest to a fireplace sitting area with the inclusion of scissor chairs designed by Ward Bennett. Upholstered in Mongolian lambswool and hide from Edelman Leather at the Boston Design Center, these confections amplify the home’s Scandinavian flair and mid-century modern style. 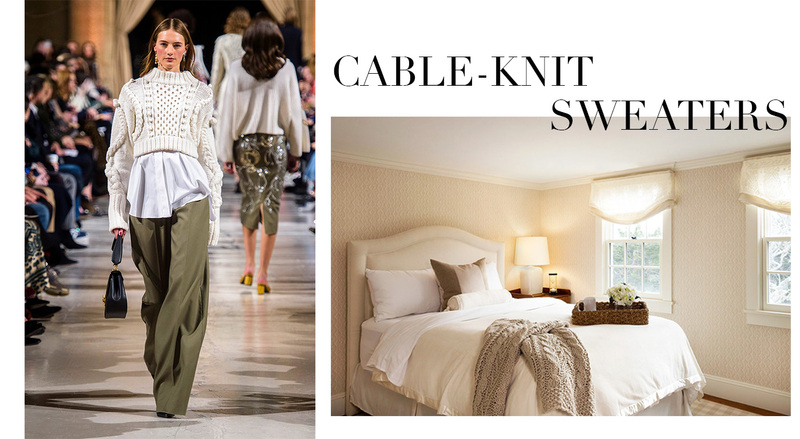 Cable-knits and fair isles are making a comeback this fall for a style we can all cozy up to. Tastemakers are putting their own stamp on the classic; Gucci adds colored trim and cuffs to an off-white cable cashmere cardigan in a nod to varsity chic, while Burberry eschews cream for magenta for a sumptuous wool/cashmere pullover. 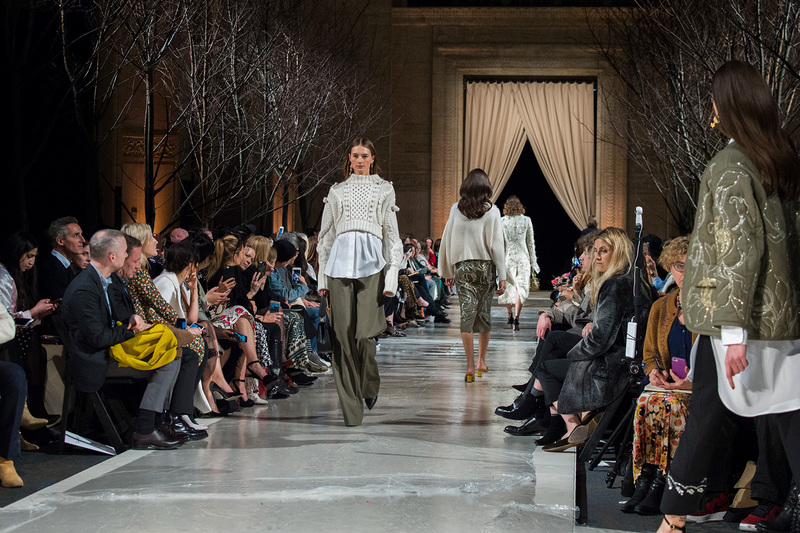 Oscar de la Renta gives a hand-stitched ivory sweater a crop, for an updated profile that is made for layering. Principal Melinda Headrick of Chatham Interiors also embraces the virtues of warm woolens. The designer adds a taupe cable-knit throw as a finishing touch to a fresh-as-cream bedroom. The chunky accent brings depth to the design, and additional softness to the relaxing, monochromatic retreat.